AmyDane Designs is still celebrating Christmas in July! So once again you will find the ABC kit in the $2 bin on Tuesday at Stuff to Scrap! This kit is normally priced at $6.99! 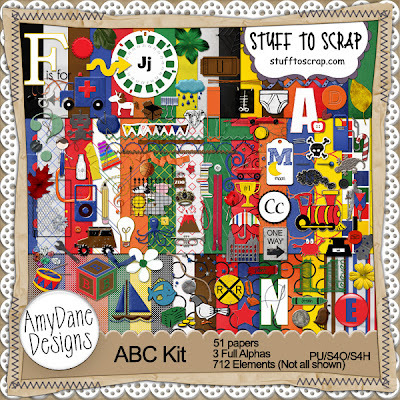 It is a ginormous kit with 51 papers, 3 Full Alphas, and over 700 Elements!!! Go HERE to purchase the ABC kit for only $2.00 on Tuesday!!!! Don't have time to create your own ABC album, this pack will give you access to a completed album in a fraction of the time. Each letter has its own 12x12 quick page just waiting for you to drop in your photos that correspond with that letter. Need help coming up with picture ideas for the letter “Q”? No worries! The kit comes with a document full of photo ideas from A to Z. No album is complete without a cover, title and end page. You can add the year, date or family name to the cover page and you are good to go. The full wrap cover will create both your front and back of the album in a snap when you go to order your book at your favorite photo store. If you would rather create a 10x10, 8x8 or 6x6 album…simply size down the original to the size you need. A perfect gift for family, friends, and grandparents your album will be the highlight of the year! 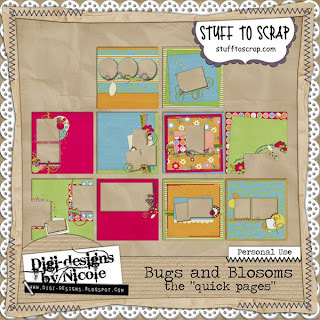 You can purchase the Quick Page Pack HERE at Stuff to Scrap! Get those digital Christmas gifts done early so you can enjoy the Holiday Season! Use the ABC Quick Page album to personalize that present for Grandma. Also in the $2.00 Bin you will find Row Your Boat! A newer kit in the store, Row Your Boat is a beautiful combination of blues. Go HERE to purchase this kit on Tuesday! 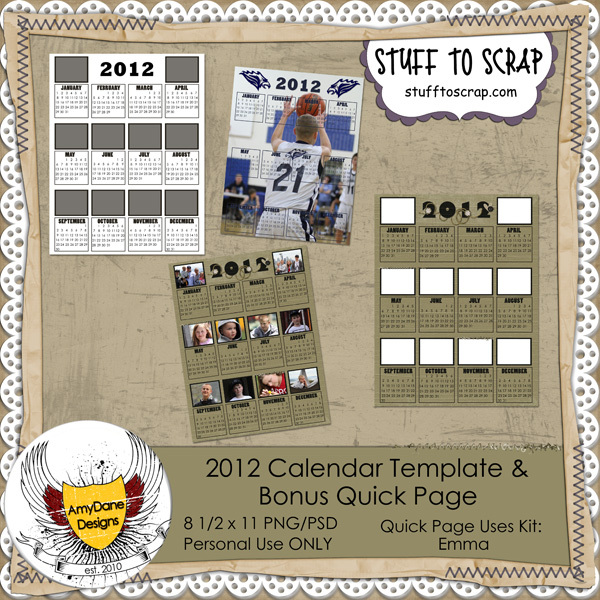 Also new this month is a 2012 Calendar Template! 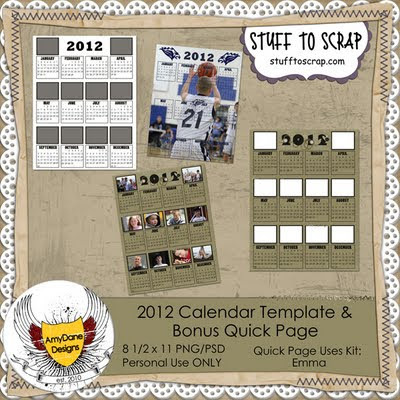 Calendars are great gifts and with this 8 1/2 x 11 template you can addyour own personal touch to all your 2012 Calendars. Use the template to add ten of your favorite photos OR add one large photo as the background. The template comes in both PNG and PSD formats. They have also included a bonus Quick Page using our new kit Emma. 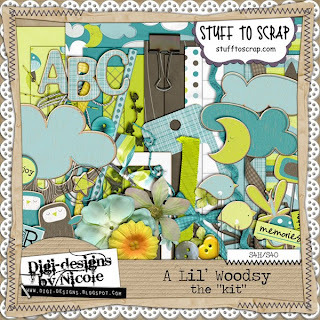 Go HERE for some fun FREE scrapbook Art using the kit ABC! 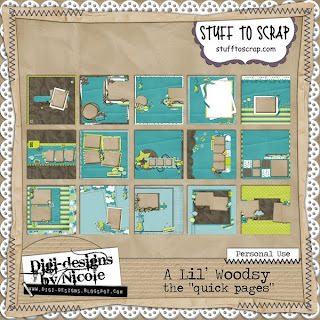 Scraps N Pieces has two fun Summer water kits in the $2 bin on Tuesday. They are totally different from each other but are both fun to play with. Get Surf’s Up with it’s coordinating QP pack and we also have Splash with a coordinating QP pack. All are only $2 each and images below are clickable to the store. 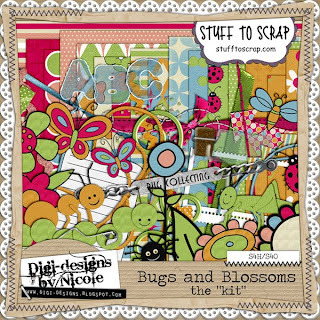 Digi-Designs by Nicole is offering two great kits and their QP packs today - A Lil Woodsy & Bugs and Blossoms.